The sociologist Jeremy Seabrook once wrote of the complexities of using photography to deal with conditions that were as much psychological as visually apparent. It feels awkward then, perhaps even paradoxical, that in an era so fearful, suspicious and conservative as ours, photographers continue to make work that seems to rest on the surface of what are deeply complex conditions. In a new book of photographs that draw on work made over the final years of the last century, Magnum photographer Abbas progresses what has become a long-term commitment to photographing religious practices (and their political consequences) internationally. After Allah O Akbar (his earlier study of militant Islam), Children of Abraham differs dramatically in size from the grand earlier Phaidon publication. Yet, in volume, it’s equally expansive, drawing together photographs of Jewish, Christian and Muslim communities throughout the world. Equally, it’s perhaps this breadth that provides the biggest challenge to the book’s success. To contextualise the pictures, Abbas presents short texts written during visits to the regions he has worked through. They act as a coda, drawing together photographs with calm, reflective reason. They are not diary extracts, in that they are not complete, specific or confessional. This is not Telex Iran  Gilles Perres’ essential and honest weaving of photography and panic. 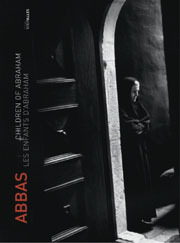 Abbas’ texts are hardly temporal, because they don’t tend to plot a particular journey or exhaust a particular event. Fundamentally, they appear to be observations, wise recollections  the memoirs of a traveller who (in his own words) “never arrives”. In their inclusion, they become drawstrings, to animate and provide cohesion for what is, in reality, a collection of pictures from incredibly disparate journeys. 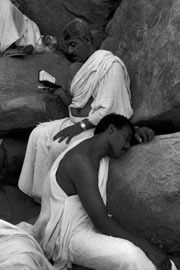 With his writing, Abbas assesses his own position within photography. By calling himself a photojournalist rather than a “photo painter” (presumably an artist who centres themselves rather than the use of their photography), he provokes a useful question: Do these pictures say more about the photographer than they manage to relate about the subject, and does this change when the pictures rest within a book? The subject itself, on these pages at least, is hard to get close to  in contrast, let’s say, to the intimacy of Larry Towell’s Mennonites project. Abbas attempts a more global reach. Photographs drawn from more thorough stories sit next to those from other regions in formal pairings; young Hassidic Jews study sacred texts and melt (at the book’s gutter) into a classroom of Egyptian children who recite the Koran; the twisted hands of a disabled child in South Korea reach out towards entwined hands in Lourdes. In this layout, though appealing, they appear of limited depth. The smaller images in the book punctuate more expansive pages, and it is these full-bleed reproductions that save the book by relating the work’s energy. Occasionally, pictures are set into the page, or set on a bed of black ink, emphasising the detail and layout of particular scenes and providing a welcome shift in pace.